Maisie is an innocent six year-old, torn between her divorced parents, pathetically isolated yet tragically involved. The only emotional constant in Maisie's life is Mrs. Wix, a motherly old governess. ©2010 AudioGO Ltd (P)2014 Audible, Inc.
James is a hard writer to read aloud. He's a hard writer to read off the page. His sentences are long, with lots of subordinate clauses, that express delicate shades of meaning. They are often beautiful, but it's a difficult beauty. Maureen O'Brien does more than make James' book understandable, she makes it live in all its subtlety. Maisie appears to be the pawn of her feckless, self-involved parents; and then the adored darling of her subsequent stepparents. The story is told more or less from Maisie's point of view. We only know as much as she does -- no, let's take that back. She might know far more than we realize she knows. Who is playing who in this bitter game? What other book might you compare What Maisie Knew to and why? It's a psychological study, alive to every nuance of expression and unstated communication, but Maisie, as all humans do, remains a mystery. I'm sure some perfect comparisons will spring to mind as soon as I finish this review. But it's safe to say that if you found Turn of the Screw unsatisfying, you will not like this either. James hands you nothing but complexity and ambiguity. In other words: life. The very last scene. It is not a spoiler to say that it is a play on the title of the book. I returned to this book after seeing the updated movie version of the book with Julianne Moore and Steven Coogan as the irresponsible, self-involved parents. But in the film, Maisie is played by a darling girl whose sweetness is touching and beautiful. Here, Maisie is far more complex. Maureen O'Brien does an amazing job capturing the accents (with all the class connotations) as well as the emotions of the characters, which requires great insight into both human nature and literature as well as great acting skills. I will search out more books read by her. Nobody writes like Henry James. Perfect narration! I wasn't sure I'd like a book about a little girl being manipulated by her parents, but I bought it because I love Henry James' writing. This is an excellent story and is made fabulous by Maureen O'Brien's narration. At first, I was startled by her rather high pitch and thought I would tire of it and never get through the book, but you know, I never did tire of it, and I have come to believe I would not have enjoyed the written novel as well without her voice. All characters are distinct, and I was actually able to conjure up particular actors for each character, so well were they portrayed. Of course, there's so much more to the story than Maisie being manipulated by her parents; in fact, nearly every adult with whom she comes in contact tries to use her for their own personal gain. She is precocious enough to resist being pulled in completely by any one person, though, and we're never really certain "what Maisie knew" because there is so little internal analysis for her. I was very frustrated with never being told how old she is as the story progresses, and I couldn't tell whether she had aged a few years or several. I had to assume we see her last as a teenager. I think it may be the only criticism I have of the book. The writing, oh, the writing! It's beautiful, and O'Brien enhanced it. This reading is as good as it gets, and shows the value of audiobooks. Hearing this book read out loud by such a capable reader brings, for me at least, a new dimension of pleasure and understanding. I thought I knew the novel well from reading off the page, but there are so many nuances that hearing it at the pace of the spoken word adds a great deal. The reading is just right -- it's a reading, but not a performance, and not overdone. Confession: I was drawn to What Maisie Knew because the movie adaptation stars Alexander Skarsgard. But I decided to read (or, in this case, listen) to the book because the story of a divorce/custody battle in the 19th century really intrigued me. It seems like such a modern issue that I was interested to see an earlier take. What I learnt was that not much has changed. Granted, it's probably more common now, but I was surprised by just how relevant the ground covered in What Maisie Knew is today. No wonder it leant itself to a modern movie adaptation! The book begins with Maisie's divorced parents fighting a vicious legal battle to try and gain custody of their young daughter. They want to hurt each other as much as (or perhaps, more than) they actually want custody of the girl. They end up getting joint custody (something that I didn't expect - I had the idea that men automatically got it back in the day), and then each try to turn Maisie against the other, openly putting each other down in front of her and sending her back and forth with petty messages. But soon they have new partners, and their fight over Maisie turns into who can spend the least time with her. She becomes a burden to be inflicted on each other. Maisie's parents are, needless to say, truly awful. My heart just broke for Maisie several times over. I actually quite liked Sir Claude, Maisie's stepfather, and it was so lovely to see her get some affection and attention from him. I didn't hate Mrs Beale, Maisie's stepmother, though I suspect I was supposed to - and I couldn't stand Mrs Wix, who I think was supposed to be an admirable, if slightly ridiculous, character. She was so self-righteous and silly - but this may just be my own modern morals framing my judgement. What Maisie Knew is told from the third person perspective of Maisie herself, and I found it quite hard to understand at times. I'm not sure if this was intentional - as though Maisie herself didn't understand what was happening - or if it was just my modern brain not picking up the subtleties and assumed knowledge the contemporary reader would have had. This made the experience quite a frustrating one, something that wasn't helped by the repetitive plot. While at first I was quite captivated my Maisie's plight, by the time she was chucked back and forth, back and forth, again and again between her various parents and step-parents, I was pretty over it. There are only so many times you can bear what is essentially the same plot point repeated in the same story. 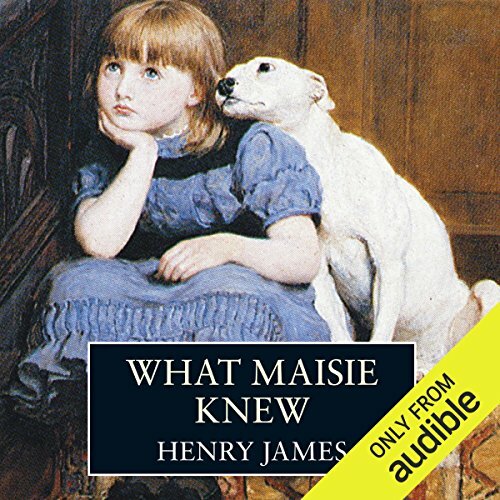 The narration by Maureen O'Brien was quite good, but by about the halfway mark, I found What Maisie Knew to be pretty unbearable. I was really tempted to quit, and only didn't because I had come so far. I was really disappointed with the ending, and unsatisfied overall. I don't know that I'll read another Henry James soon.